The sea ice in northern Alaska is teeming with many species of algae. These algae form a key part of the Arctic food web, providing a valuable food source to organisms at the foundation of the food chain. During the cold, dark winter months the algae are locked in the ice. But with spring’s arrival they are poised to bloom, transit out of the ice and become available to millions of sea worms, crustaceans and other micro fauna that will feast off of them. These bloom events, as well as the fate of the carbon associated with them, are at the heart of a National Science Foundation-supported project led by Craig Aumack, a post-doctorate researcher at Columbia University’s Lamont–Doherty Earth Observatory. Aumack’s research focuses on Arctic algal communities and communal ecology within the sea ice. Aumack recently arrived in Barrow, Alaska to prepare for the second season of data collection associated with the project. His findings will shed light on the roles sea ice algae play in the Arctic ecosystem. This month, he chats with Field Notes about the questions he hopes to answer with this two-year project, as well as the upcoming field season. Field Notes (FN): What are they key questions you hope to answer by studying Arctic ice algae and the organisms that feed off of it? Craig Aumack (CA): We are interested in finding out more about the ultimate fate of sea ice carbon, specifically the algal material that builds up within the sea ice. We know there’s an algal bloom event each spring, and that it [the algae] actively exports out of the sea ice into the water well before complete sea ice melt in open water. That’s a huge flush of material that reaches these marine systems, but what happens to that material? Does it get consumed in the water column? Does it reach the benthos where it’s eaten by bottom-dwelling animals? There aren’t too many studies that look into this and ascertain the importance of this sea ice algae to the ecosystem. We’re interested in tracking that material in the biological food webs, both in the water column and on the bottom. FN: What roles do sea ice algae play in the Arctic ecosystem? CA: We know this algal community builds up a huge amount of carbon—not just within the cells, but in materials, like carbohydrates, that exude out the cells. All of this is very nutritious to animals that live in the water column and on the bottom. It’s a great food source that is generally unattainable while it’s in the ice. FN: What happens to that food source once it leaves the ice? CA: Before it’s exported from the ice, there is not very much activity in the water column or on the benthos. Once it’s exported, the benthos is teeming with life. And all this is happening during an ice-covered state. Our ice work is showing that not only is it an important food source, but it’s a food source that’s being made available before everything thaws. Animals are coming out of their hibernetic state and feeding on these algae well before the sea ice or rivers have thawed. FN: How do you make these observations? CA: We have cameras that we can lower through the ice. FN: What types of animals do you typically find feeding off the sea ice algae? 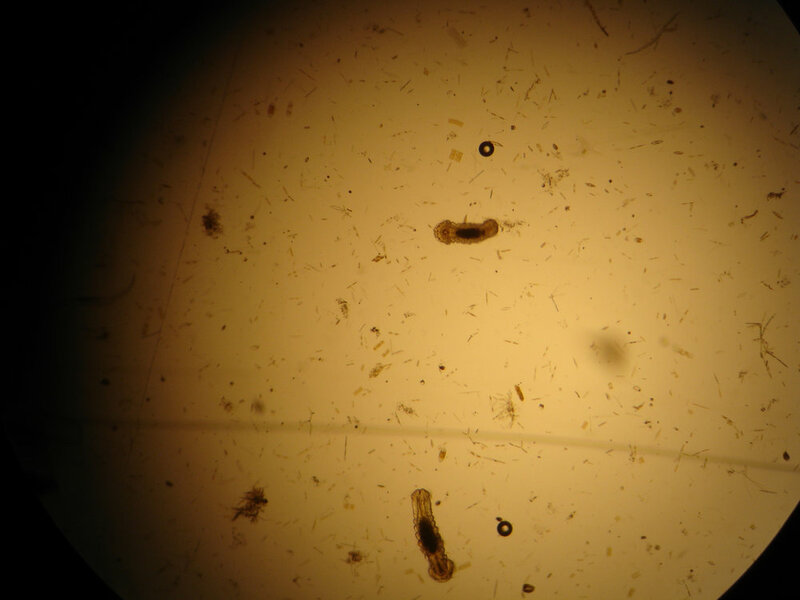 CA: In the ice we primarily see polychaete larvae and various species of copepods. In the water column, it’s primarily copepods, amphipods, gelatinous grazers, such as jellies and comb jellies. Then along the bottom we see benthic-dwelling crustaceans, amphipods and isopods. There are also a lot of different worms—from flatworms to polychaetes, annelids and nematodes. We see fish too, but we’ve never actually caught one! FN: You are currently in Barrow, Alaska to prepare for data collection this summer. Please tell us what you’ll be doing during the 2014 field season. CA: Primarily we’ll be drilling holes in the ice, collecting ice cores, capturing the algal material within the ice and measuring it isotopically, as well as looking for specific lipids. We’ll also capture animals in the water column and those that live along the benthos using grabs to look at their lipid content, their DNA, isotopic ratios and even the material within their guts to see if I can trace the ice algae signal in the grazers. If I can find the DNA of ice algae within the guts of certain organisms, then that’s just proof they are actively grazing on it. CA: When we capture these organisms, we do plan on doing feeding assays where we allow them to only graze on ice algae to measure feeding rates. We’ll also do choice assays where we present the organisms with other food to see what they prefer to eat. Nutritionally, ice algae are a good food source. We want to see if the organisms have adapted to prefer to eat this material versus other material if offered it. FN: What can this study help us understand about the Arctic ecosystem? CA: It’s difficult to say how important the sea ice algae are in terms of production. But in terms of the food web, the higher orders of megafauna—the seals, bears, fish—all of those higher order predators rely on a certain amount of material being available in the trophic levels below them. So that’s where the grazers are important. Andif the grazers aren’t getting enough food, or the nutritional value of that food is decreased, we want to know how that impacts the food chain. Year after year, we are recording record lows of sea ice in the Arctic. We are trying to understand how important this material within the ice is to these food webs under the assumption that with each year there may be less available.